The first sign of an ear infection may be an increase in irritability. Some children cry inconsolably. You may notice your child pulling or tugging on the ear. In addition to a painful earache that is worse when lying down, symptoms of ear infection include fluid discharge from the affected ear, a feeling of fullness in the ear, difficulty hearing, trouble sleeping, headache, fever, dizziness, vomiting, diarrhea, and a lack of appetite. 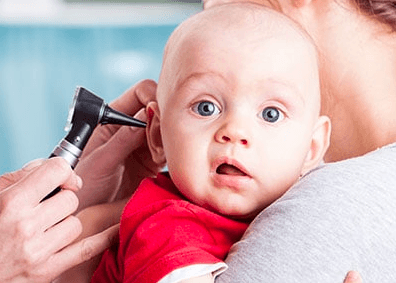 An ear infection is easily diagnosed through an examination of your child’s ears with an otoscope. If the ears appear dull or red, contain fluid behind the eardrum or pus inside the middle ear, then an ear infection is likely to blame. A hearing test may be recommended, especially if your child has had ear infections in the past. Middle ear infections are common in children, particularly those between the ages of six months and two years. Most ear infections clear up on their own, or are treated with antibiotics. But in some children, they can become a chronic problem that causes other issues, such as delays in speech development and learning. For these children, ear tubes may be recommended. Ear tubes are tiny cylinders, made from plastic or other materials, which are surgically inserted into the eardrum. They are meant to remain in place from six months to as long as several years; at some point they will either fall out on their own, or will need to be surgically removed. The surgery to place the tubes, known as a myringotomy, is an outpatient procedure performed under general anesthesia. Fluid behind the eardrum is suctioned out, a small incision is made in the eardrum, and the tube is inserted. The procedure is quick and painless, and usually takes no longer than 15 minutes. Earwax (cerumen) is a yellowish waxy substance produced by healthy ears. Earwax protects the ear from bacteria, water and foreign particles. It also assists in the cleaning and lubrication of the ear canal. Usually, excess wax is removed from the ear canal naturally. If a buildup does occur, the earwax will become hard and block the ear. Earaches, a feeling of fullness in the ear, hearing loss and ringing in the ear (tinnitus) are all common signs of earwax blockage. If the earwax is not removed an infection can develop. In order to diagnose a buildup of earwax, your doctor will need to look in your ear with a special magnifying instrument called an otoscope. Once diagnosed, your doctor can remove the wax buildup a few ways: with a small curved instrument called a curette, through suction or by flushing out the wax using a water pick or warm water. If this continues to be a problem, wax-removal medications may be recommended.